Memento mori (Latin: "remember that you have to die") is the medieval Latin Christian theory and practice of reflection on mortality, especially as a means of considering the vanity of earthly life and the transient nature of all earthly goods and pursuits. In art, the memento mori is used to remind the viewer of their mortality and of the shortness and fragility of human life. Below, a handful of Paul Cézanne's gorgeous paintings containing the classic memento mori- the skull. Unsurprisingly, the objects and colors of Cézanne's studio reflect his canvases. An image from Cézanne’s studio in Aix-en-Provence. The study of gray is not something we often think about in the works of most modern artists. Perhaps the pointillists were the last to study the ways in which color aggregated to form grays in the shadows beneath tables, under sun bonnets, in the dappled light of trellises or on city pavements. As I walked around Cézanne’s studio, I noticed that light bouncing up from the warm wooden flooring tinted the gray nearest it with rose and that under the shelves the light caromed back and forth between wall and shelf, carrying the subtle tones of whatever was nearby. These extremely delicate gradations were everywhere visible to me in the overall grayness and made me realize that we too often simply accept a generalized idea about the colors in our visual surround. -Excerpted from Cézanne’s Objects by Joel Meyerowitz. Copyright © 2017. Reprinted with the permission of Damiani. All rights reserved. For more information on Paul Cézanne, Artsy's page provides visitors with Cézanne's bio, over 170 of his works, exclusive articles, and up-to-date Cézanne exhibition listings. Avril Furness asks women of all ages what they want to be buried in in her video for Nowness while traveling through the oven rooms at Mortlake Crematorium, the hearse garages at Harrison Funeral Home, and a fresh grave site at Green Acres Natural Burial Ground. What do you choose for your final look? If you don’t want your ashes spread along a favorite location or stored for decades on a relatives mantel, then why not be memorialized in a truly unique and timeless way… as a diamond! Cremation ash can now be turned into high-quality diamonds. Yes, the 4 Cs still apply, you can choose the cut, carat, color and clarity of this special gem. You can even choose to be a brilliant diamond in different colors. I MEAN, who doesn’t want to be a 5 carat, flawless, vivid yellow diamond? This service isn’t only reserved for people, you can turn your pet's ashes into diamonds as well. You can also plan ahead through sites like LifeGem and create unique diamonds for each person in your family. What better way to celebrate a loved ones life than to become a family heirloom that can be passed from generation to generation—a truly special diamond. 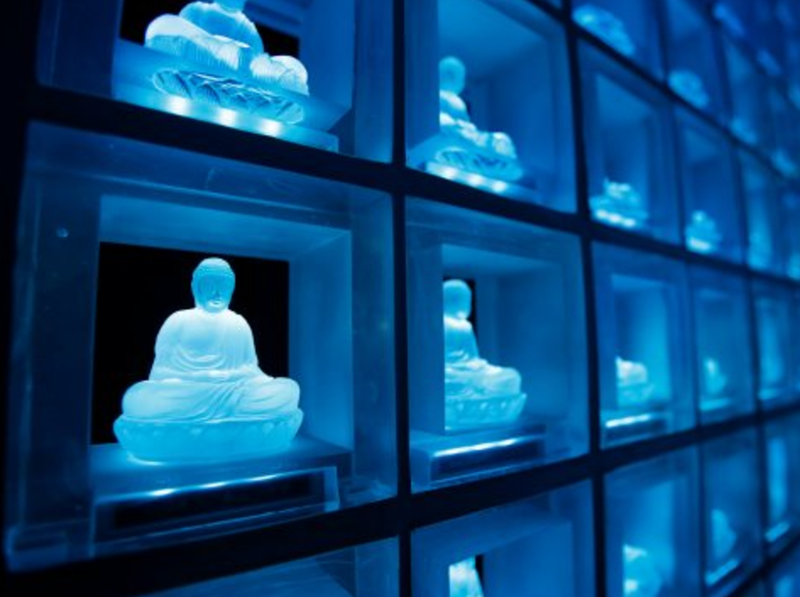 Each tiny blue glowing Buddha covering the walls of Bansho-ji Temple's third floor represents one of the deceased. 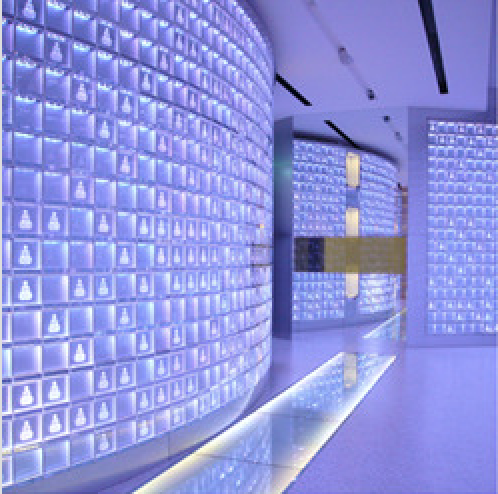 Visitors located their passed loved one with an electronic ID card which turns the blue buddha to gold. The effect is a chillingly beautiful tribute to an increasingly solitary population. 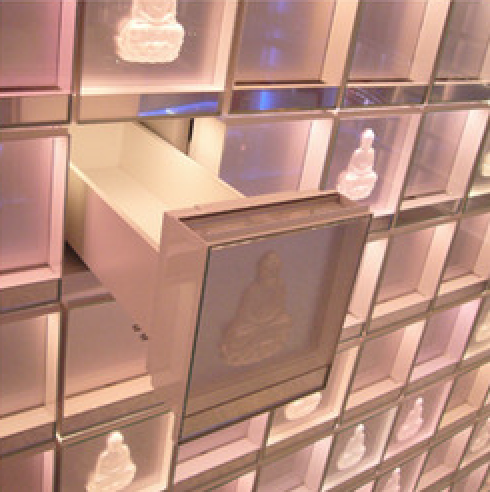 These innovative temples are becoming more popular in Japan where low fertility rates leave fewer young people to care for the aging and fund a traditional burials (which can cost thousands more). Not only are handmade willow caskets beautiful, they are an ecologically beneficial alternative to the traditional casket. 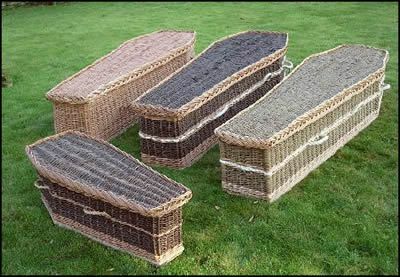 Woven caskets are traditionally made in the UK where natural burials are more common, but the desire for natural burials and biodegradable caskets in the US are growing in popularity. Currently, they are allowed only at a handful of cemeteries in states such as California, South Carolina, Florida, Texas and New York. Willow integrates with its surrounding land exceptionally well, providing a natural habitat for many species of wetland birds and animals. It is used as a natural engineering solution—biofiltration, constructed wetlands, ecological wastewater treatment, hedges, land reclamation, bio engineering, soil erosion control... just to name a few! Willow is even a great flood-defense, consuming much more water than agricultural crops. Planing willow in flood-prone zones takes pressure off the natural landscape. Willow decomposes much more quickly than conventional coffin materials such as MDF, hardwood, and metal. The plants themselves—Salix Triandra—last 60 years before needing to be re-planted. Even the harvesting of the willow plants uses minimal machinery, and the plants are often hand-sowed. 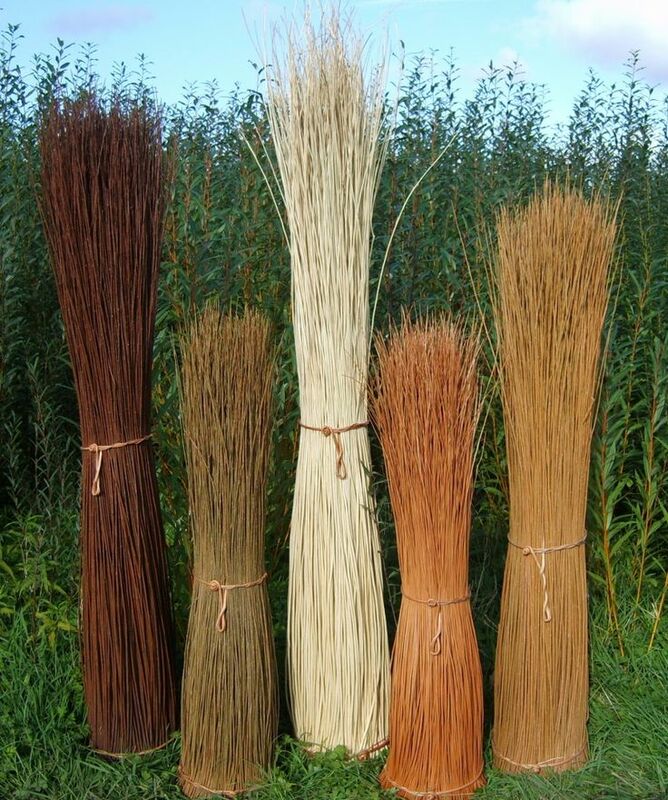 At companies like Somerset Willow, you can choose colors, handle style, and shape on their website, and their experienced artisans will hand-weave a gorgeous willow casket (or urn!) to your taste. Once harvested, the willow is boiled and the bark is stripped. The willow is soaked for pliability and the hand-weaving begins. Each artisan must train for a minimum of five years at Somerset to perfect their skills. The caskets are finished with a natural cotton liner and oak name plate. The fascinating story of Somerset Willow and their founder Edward Hill is worth a look. 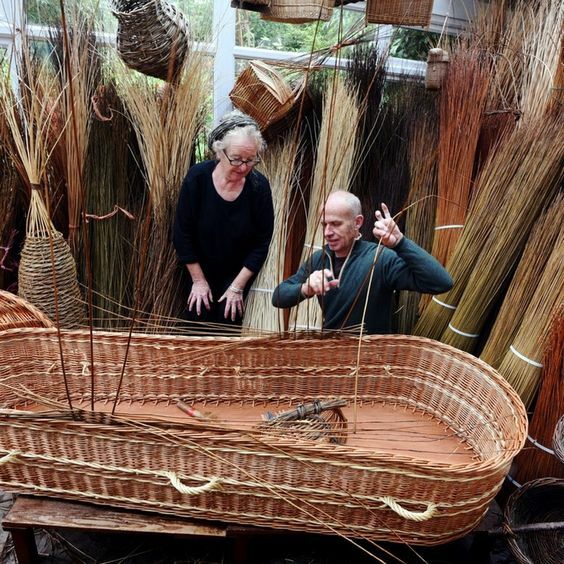 You can even learn to weave your own willow coffin! Going Out in Style created William Graper's ultimate funeral for Harper's Bazaar. Walter Kuhlman (1918 – 2009) was an abstract expressionist painter based in San Francisco. The image of the human skull has appeared in several of Kuhlman's paintings. Here, a hunched skull-headed figure stares at a floating flower garland. Death yearning for life. At Going Out in Style we think that death and loss can be celebrated many ways... with beauty, style, and even joy. 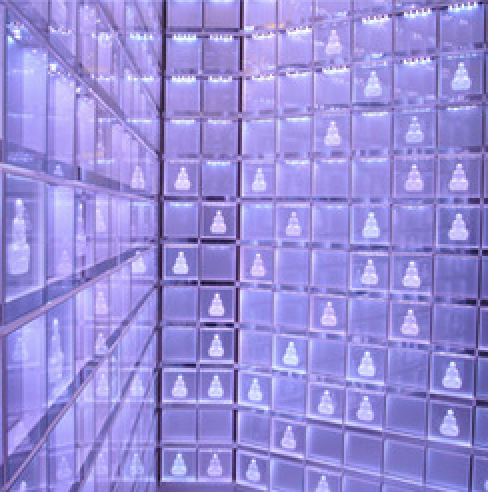 That's why we so admire the work of I&S BBDO for funeral home Nishinihon Tenrei in Japan. It is traditional that Japanese funerals be dark, somber, and colorless and any deviation is considered taboo. But after the devastating 2011 Tohoki earthquake and tsunami, Nishinihon Tenrei decided it was time to celebrate the cycle of life with color. The result was this beautiful and award-winning campaign. Beyond the familiar “green burial” business of escaping the toxic culture of the conventional death industry, what appeals to author Richard Conniff (and a growing number of people) is the idea of using the cost of burials to buy and preserve undeveloped land. "Natural burial grounds" or "forest cemeteries" tend to look less like cemeteries and more like fields and woods, with walking trails. "I doubt that I put it in so many words at the time, but the thought has lately come back to me: This is how I want to be dead. That is, in the woods, with wild things all around." Op-ed in the July 7, 2017 New York Times, read it here. Death Over Dinner brilliantly opens up conversations about death over dinner. 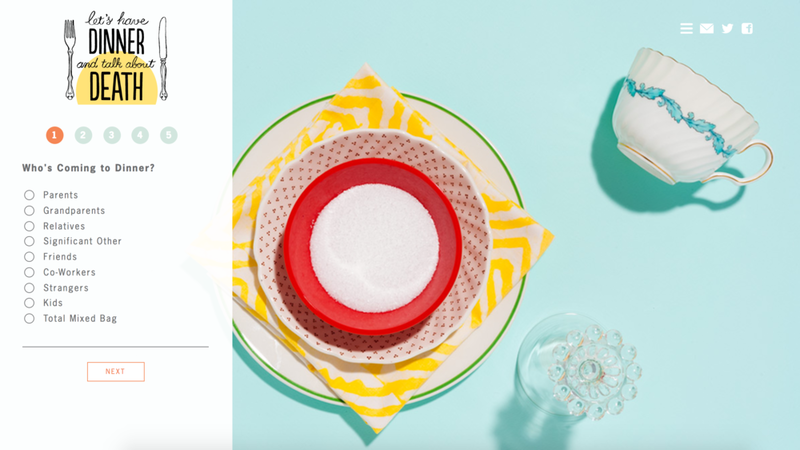 Their survey helps you set up the conversation based on guests and intention and even provides recommended reading and listening before the party. 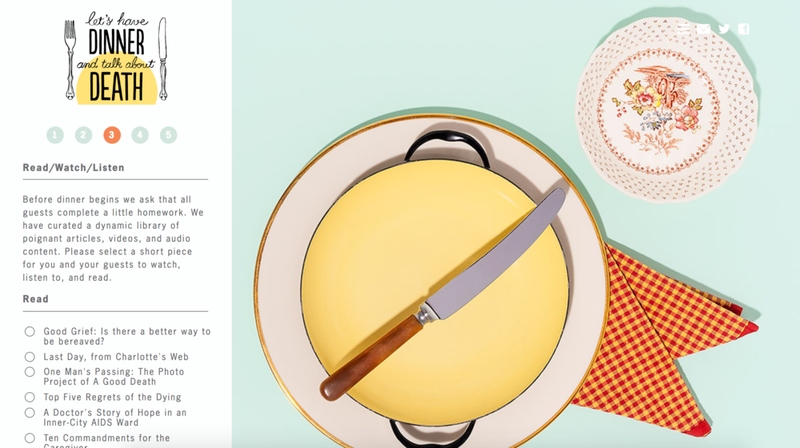 Not only is Death Over Dinner a fantastic and effective tool for important conversations, the site is beautiful, clean, and simple. What's your dream memorial ceremony? Companies such as Heavens Above and Heavenly Stars Fireworks and Ashes to Ashes provide amazing and unique memorial displays. They offer a variety of services for scattering ashes of yourself or a loved one by incorporating cremation ash into fireworks. Depending on your wishes, you can have a professionally launched display or choose from a wide array of self fired rockets. We love the idea of being sent off in style with a firework spectacular to be remembered by; literally going out with a bang. Strangers coming together to talk about grief and loss over a beautiful meal... this is our kind of dinner party at Going Out in Style. The Dinner Party takes fear and taboo out of the conversation and creates an environment that facilitates #lifeafterloss. They hope that one day young people who have experienced loss are recognized not as objects of pity, but as better listeners and better leaders, characterized by profound empathy, resilience, and agency. Their mission- To transform life after loss from an isolating experience into one marked by community support, candid conversation, and forward movement.